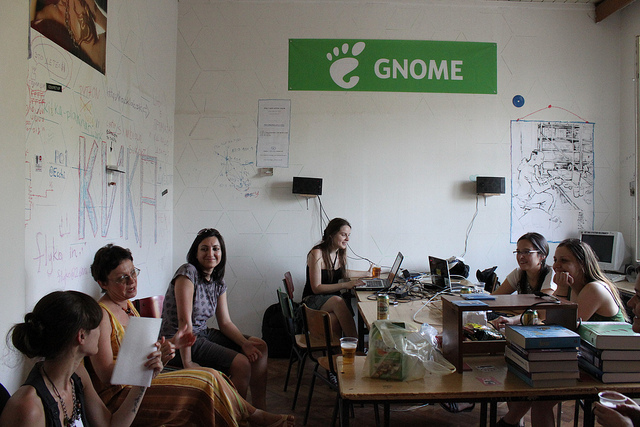 Then the Gnome Women Outreach Program was announced and 2 more girls came to the hacklab. After a successful story in GWOP and GSOC, me and Tamara Atanasoska started promoting what we have done, what other girls can do for the community, for themselves and trying to involve more girls. Guys from the hacklab helped a lot. So now we are 6 girls in the hacklab in year and a half, no matter if they got accepted in some program or not, everyone of them is still working on the project or got involved in new one. There are also 3-4 more girls that come to the hacklab once in a while. Now we also have a lot of help from Ana Risteska, she was also an intern. In the hacklab we have regular program very week, on Monday (GNU/Linux first aid), Thursday (Programming Languages) and on Saturday (Sharing of knowledge), but you can find someone there during all week. During this events we are inviting some of our friends to come and see how things work there. This year Free Software Macedonia and one university for computer science organized kind of a course, once a week, about Free Software and Open Source. It was nice to see around 10 girls in 30 people interested in the lectures. We are continuing the lectures in few weeks and we are hoping that there will be more people that share our interests. There are few girls in hacklabs in Balkan and this is an issue. As we organize events together (called NSND or Nothing Will Happen) with hacklabs from Serbia, Croatia, Albania and Kosovo, everyone asks us how did we manage to stay in the hacklab and how can they manage to get girls to also be part of theirs community, since they have none, or 1 or 2 girls. And usually the girls are invited to some of the local communities to present to other girls that if they really want to get involve they can make it.